This is the D12-3 Standard Model Rocket Engines/Motors from Estes. Suitable for Ages 10 & Older with Adult Supervision for Those Under 12. Estes products may contain chemicals known to the State of California to cause cancer, birth defects or other reproductive harm. Retail $11.99 SAVE 23% ! Good motor over all, nothing special about it. If your looking for a motor to use in a 10 oz rocket, D12-3 is the motor. Standard engine designed for flights in rockets weighing les than 14 ounces, including the engine. Engines tested and certified by the NAR. "Great motor for rockets that fly D & E"
These are excellent for rockets that fly on D & E motors when you&apos;re on a field that&apos;s too small to handle the E load. The trust curve shows the same numbers as the E9, but with a bit shorter burn time. I use these for all my heavier D sized rockets and many of my E rockets. the shorter delay mates well for this application. 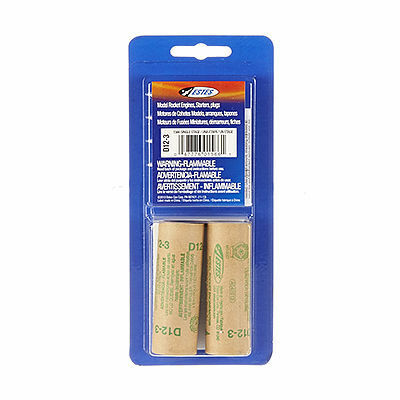 If your launching a really light weight D rocket look to the longer delays but for the larger stuff these are perfect. WARNING: Flammable. Read instructions before use.